A liquid is a nearly incompressible fluid that conforms to the shape of its container but retains a (nearly) constant volume independent of pressure. As such, it is one of the four fundamental states of matter (the others being solid, gas, and plasma), and is the only state with a definite volume but no fixed shape. A liquid is made up of tiny vibrating particles of matter, such as atoms, held together by intermolecular bonds. Like a gas, a liquid is able to flow and take the shape of a container. Most liquids resist compression, although others can be compressed. Unlike a gas, a liquid does not disperse to fill every space of a container, and maintains a fairly constant density. A distinctive property of the liquid state is surface tension, leading to wetting phenomena. Water is, by far, the most common liquid on Earth. The density of a liquid is usually close to that of a solid, and much higher than in a gas. Therefore, liquid and solid are both termed condensed matter. On the other hand, as liquids and gases share the ability to flow, they are both called fluids. Although liquid water is abundant on Earth, this state of matter is actually the least common in the known universe, because liquids require a relatively narrow temperature/pressure range to exist. Most known matter in the universe is in gaseous form (with traces of detectable solid matter) as interstellar clouds or in plasma from within stars. Many gases can be liquefied by cooling, producing liquids such as liquid oxygen, liquid nitrogen, liquid hydrogen and liquid helium. Not all gases can be liquified at atmospheric pressure, however. Carbon dioxide, for example, can only be liquified at pressures above 5.1 atm. A lava lamp contains two immiscible liquids (a molten wax and a watery solution) which add movement due to convection. In addition to the top surface, surfaces also form between the liquids, requiring a tension breaker to recombine the wax droplets at the bottom. Similarly, liquids are often used in cooking for their better heat-transfer properties. In addition to better conductivity, because warmer fluids expand and rise while cooler areas contract and sink, liquids with low kinematic viscosity tend to transfer heat through convection at a fairly constant temperature, making a liquid suitable for blanching, boiling, or frying. This phenomenon was also exploited to produce lava lamps. Even higher rates of heat transfer can be achieved by condensing a gas into a liquid. 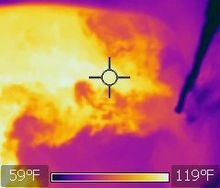 At the liquid's boiling point, all of the heat energy is used to cause the phase change from a liquid to a gas, without an accompanying increase in temperature, and is stored as chemical potential energy. When the gas condenses back into a liquid this excess heat-energy is released at a constant temperature. This phenomenon is used in processes such as steaming. Since liquids often have different boiling points, mixtures or solutions of liquids or gases can typically be separated by distillation, using heat, cold, vacuum, pressure, or other means. Distillation can be found in everything from the production of alcoholic beverages, to oil refineries, to the cryogenic distillation of gases such as argon, oxygen, nitrogen, neon, or xenon by liquefaction (cooling them below their individual boiling points). The volume of a quantity of liquid is fixed by its temperature and pressure. Liquids generally expand when heated, and contract when cooled. Water between 0 °C and 4 °C is a notable exception. On the other hand, liquids have little compressibility. Water, for example, will compress by only 46.4 parts per million for every unit increase in atmospheric pressure (bar). At around 4000 bar (nearly 4000 times atmospheric pressure) water experiences only an 11% decrease in volume. Incompressibility makes liquids suitable for transmitting hydraulic power, because a change in pressure at one point in a liquid is transmitted undiminished to every other part of the liquid and very little energy is lost in the form of compression. However, the negligible compressibility does lead to other phenomena. The banging of pipes, called water hammer, occurs when a valve is suddenly closed, creating a huge pressure-spike at the valve that travels backward through the system at just under the speed of sound. Another phenomenon caused by liquid's incompressibility is cavitation. Because liquids have little elasticity they can literally be pulled apart in areas of high turbulence or dramatic change in direction, such as the trailing edge of a boat propeller or a sharp corner in a pipe. A liquid in an area of low pressure (vacuum) vaporizes and forms bubbles, which then collapse as they enter high pressure areas. This causes liquid to fill the cavities left by the bubbles with tremendous localized force, eroding any adjacent solid surface. would be the atmospheric pressure. Static liquids in uniform gravitational fields also exhibit the phenomenon of buoyancy, where objects immersed in the liquid experience a net force due to the pressure variation with depth. The magnitude of the force is equal to the weight of the liquid displaced by the object, and the direction of the force depends on the average density of the immersed object. If the density is smaller than that of the liquid, the buoyant force points upward and the object floats, whereas if the density is larger, the buoyant force points downward and the object sinks. This is known as Archimedes' principle. Unless the volume of a liquid exactly matches the volume of its container, one or more surfaces are observed. The presence of a surface introduces new phenomena which are not present in a bulk liquid. This is because a molecule at a surface possesses bonds with other liquid molecules only on the inner side of the surface, which implies a net force pulling surface molecules inward. Equivalently, this force can be described in terms of energy: there is a fixed amount of energy associated with forming a surface of a given area. This quantity is a material property called the surface tension, in units of energy per unit area (SI units: J/m2). Liquids with strong intermolecular forces tend to have large surface tensions. 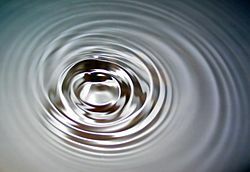 A practical implication of surface tension is that liquids tend to minimize their surface area, forming spherical drops and bubbles unless other constraints are present. 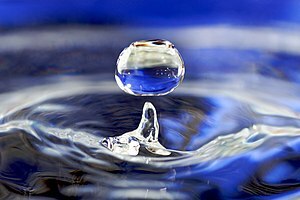 Surface tension is responsible for a range of other phenomena as well, including surface waves, capillary action, wetting, and ripples. In liquids under nanoscale confinement, surface effects can play a dominating role since – compared with a macroscopic sample of liquid – a much greater fraction of molecules are located near a surface. The surface tension of a liquid directly affects its wettability. Most common liquids have tensions ranging in the tens of mJ/m2, so droplets of oil, water, or glue can easily merge together and adhere to other surfaces, whereas liquid metals such as mercury may have tensions ranging in the hundreds of mJ/m2, thus droplets do not combine easily and surfaces may only wet under specific conditions such as temperature. Although temperature changes may vastly alter a liquid's viscosity, such as in a supercooled liquid like honey, changes in viscosity have very little effect on surface tension. A simulation of viscosity. The fluid on the left has a lower viscosity and Newtonian behavior while the liquid on the right has higher viscosity and non-Newtonian behavior. An important physical property characterizing the flow of liquids is viscosity. Intuitively, viscosity describes the resistance of a liquid to flow. More technically, viscosity measures the resistance of a liquid to deformation at a given rate, such as when it is being sheared at finite velocity. A specific example is a liquid flowing through a pipe: in this case the liquid undergoes shear deformation since it flows more slowly near the walls of the pipe than near the center. As a result, it exhibits viscous resistance to flow. 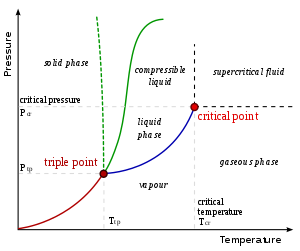 In order to maintain flow, an external force must be applied, such as a pressure difference between the ends of the pipe. The viscosity of liquids decreases with increasing temperature. Precise control of viscosity is important in many applications, particularly the lubrication industry. One way to achieve such control is by blending two or more liquids of differing viscosities in precise ratios. In addition, various additives exist which can modulate the temperature-dependence of the viscosity of lubricating oils. This capability is important since machinery often operate over a range of temperatures (see also viscosity index). The viscous behavior of a liquid can be either Newtonian or non-Newtonian. 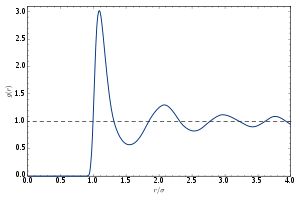 A Newtonian liquid exhibits a linear strain/stress curve, meaning its viscosity is independent of time, shear rate, or shear-rate history. Examples of Newtonian liquids include water, glycerin, motor oil, honey, or mercury. A non-Newtonian liquid is one where the viscosity is not independent of these factors and either thickens (increases in viscosity) or thins (decreases in viscosity) under shear. Examples of non-Newtonian liquids include ketchup, mayonnaise, hair gels, play dough, or starch solutions. where K is the bulk modulus of the fluid, and ρ the density. To give a typical value, in fresh water c=1497 m/s at 25 °C. Liquids can form solutions with gases, solids, and other liquids. Two liquids are said to be miscible if they can form a solution in any proportion; otherwise they are immiscible. As an example, water and ethanol (drinking alcohol) are miscible whereas water and gasoline are immiscible. In some cases a mixture of otherwise immiscible liquids can be stabilized to form an emulsion, where one liquid is dispersed throughout the other as microscopic droplets. Usually this requires the presence of a surfactant in order to stabilize the droplets. A familiar example of an emulsion is mayonnaise, which consists of a mixture of water and oil that is stabilized by lecithin, a substance found in egg yolks.
. In normal liquids, most of this cross over takes place at frequencies between GHz and THz, sometimes called hypersound. ^ "Compressibility of Liquids". hyperphysics.phy-astr.gsu.edu. Archived from the original on 7 December 2017. Retrieved 8 May 2018. ^ "Viscosity Index". UK: Anton Paar. Retrieved 29 August 2018. ^ Born, Max (1940). "On the stability of crystal lattices". Mathematical Proceedings. Cambridge Philosophical Society. 36 (2): 160–172. Bibcode:1940PCPS...36..160B. doi:10.1017/S0305004100017138. Archived from the original on 2015-11-19. ^ Born, Max (1939). "Thermodynamics of Crystals and Melting". Journal of Chemical Physics. 7 (8): 591–604. Bibcode:1939JChPh...7..591B. doi:10.1063/1.1750497. Archived from the original on 2016-05-15. ^ D.B. Macleod (1923). "On a relation between the viscosity of a liquid and its coefficient of expansion". Trans. Faraday Soc. 19: 6. doi:10.1039/tf9231900006. ^ G.W. Stewart (1930). "The Cybotactic (Molecular Group) Condition in Liquids; the Association of Molecules". Phys. Rev. 35 (7): 726. Bibcode:1930PhRv...35..726S. doi:10.1103/PhysRev.35.726.